I also divided the frosting into 3 sections and added the food gel coloring to that too. And a perfect way to end the month. 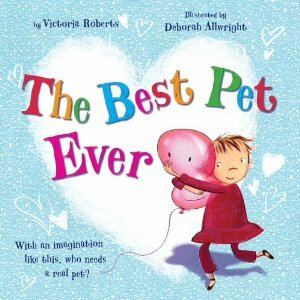 The Best Pet Ever is a fun little story about a little girl who really wants a pet. She uses her imagination and finds pets in many different objects. She really does get the best pet ever - a little kitten. His favorite part of the whole story is when the little girl hugs her balloon pet and it pops with a big Bang. He breaks out in fits of giggles and his laugh is so contagious, that we all laugh with him. We highly recommend this book to anyone with an imaginative child seeking the best pet ever. Disclosure: I received the book The Best Pet Ever from Tiger Tales for review purposes only. The opinions herein are my own and were not influenced in any way. Remember my DIY Kids Art Display? I thought it needed something, so I just whipped this up. I just used white duck cloth (same thing as canvas), black stenciled letters and twine. You can't see it very well, but there is white ribbon tied onto each end too. 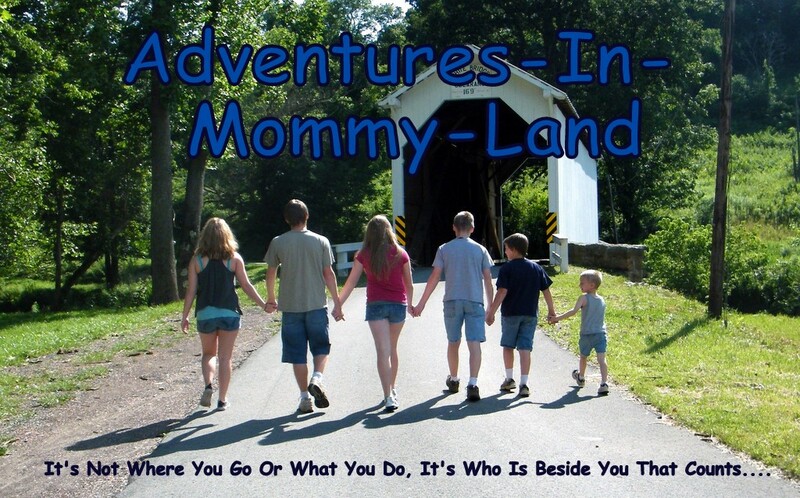 Coming Soon. . . .
Adventures In Mommy Land will be adding a new feature on Mondays. A new linky party featuring all the crafty fun we do with our children. Every Monday, you will be able to link up and show off the cute, fun things you made with your children....this could be craft projects - tips - baking/cooking fun. Anything you want to share that you did with your children. I'm planning on starting this sometime in October, if all goes well. So get all those fun fall halloween projects rolling along and get ready to share in the fun. I can't wait to see and read all your fun craft ideas!! As a mom, I know all too well how busy we are shuffling kids to and from activites, school functions and running errands. We often come last on our to do list...between caring for our families and all the juggling we do, we tend to forget to eat, exercise and sometimes, even breathe. This post and these tips are a reminder to all mothers to take care of ourselves...we deserve to be healthy and happy too. Afterall, a happy, healthy family deserves a happy, healthy mom. You don’t necessarily need to eat more, just more often so you’ll never let yourself get too hungry. Try to have something within the first two hours you’re awake (after exercise is fine if you prefer to work out on an empty stomach), and add a small snack if you’ll be going longer than four hours between meals. But don’t feel obligated to get those six “mini meals” we always hear about – forcing in too many small meals can mean overzealously squeezing a snack in every hour or two, adding unnecessary calories. Strive to incorporate a source of fiber, protein, and a little bit of fat with every meal and snack. Think whole grain baked chips topped with 2% reduced-fat shredded cheese and a dab of guacamole. Or something as simple as low-fat cottage cheese or plain Greek yogurt with berries with a bottle of water. The combo of fiber, protein and fat – along with the fluid – will work to keep you satisfied longer, helping to minimize mindless snacking. Staying well-hydrated is essential for maintaining optimal energy levels and preventing muscle cramping and headaches. But it doesn’t mean you have to force down gallons of plain old water. To actually enjoy drinking the water you need, just add flavor! You can even do it naturally with Crystal Light Pure. It’s got no artificial sweeteners, flavors, or preservatives and is sweetened with sugar and Truvia, a natural sweetener derived from the stevia plant, all with just 15 calories per serving. Keeping track of everything you eat can help you eat smarter and may double your odds of weight loss success. It doesn’t have to be anything formal – just jot a quick note of meals or snacks, or tap it into an app on your smartphone. This increase in awareness of our habits can translate to a change in our behaviors, which is essential for losing weight and (more importantly) keeping it off. One study of nearly 1,700 people actually found that those who kept daily food logs lost twice as much weight as people who didn’t. *Disclosure: Kraft Foods sent me a sample of Crystal Light Pure for sponsoring this post. I do believe in these tips and have been trying them out on myself. Last year we made glitter leaves (and we may do this again, because it was a fun craft to make and well, we got to use glitter Ha). This year, we made marbled leaves. You will need shaving cream, paint and a squeegee. Any old shaving cream will do. I traced and cut leaves onto paper plates, you need sturdy paper (like card stock, but since I didn't have any card stock, I used paper plates). Spread the shaving cream in a large, wide bowl and add some paint. We used fall leaf colors, of course (red, orange, yellow, brown and green). Take the handle of a wooden spoon and swirl the colors together. Set aside for about 10 minutes or so. Next, squeegee the shaving cream/paint mixture off the leaf. Looks absolutely fabulous, doesn't it? 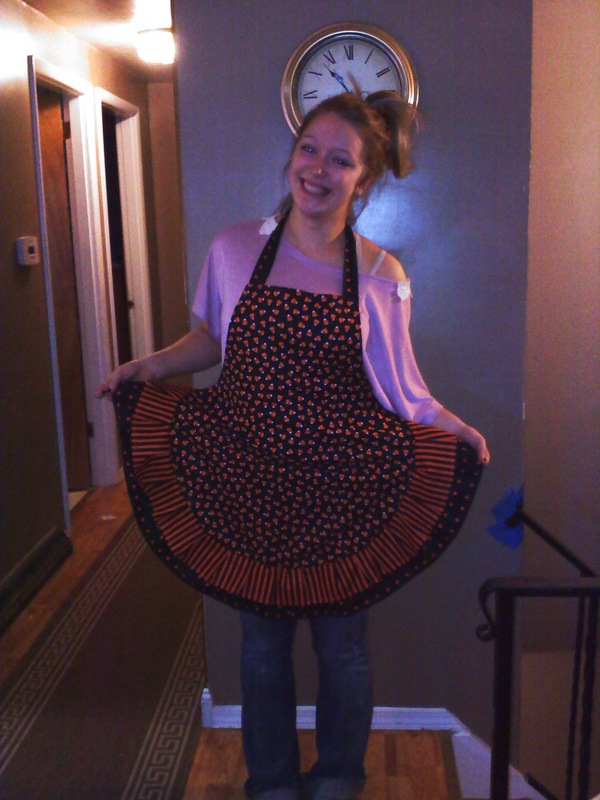 I made this cute little Halloween apron. I just winged it...no pattern. Then, I added another layer of ruffles. I made some ties for the neck and waist. All aprons should be modeled by beautiful girls. I had enough fabric leftover that I made another one....debating on doing a future giveaway or something with the other one (don't worry, I'll let you know when I decide). I started with a glass hurricane from the Dollar Store. 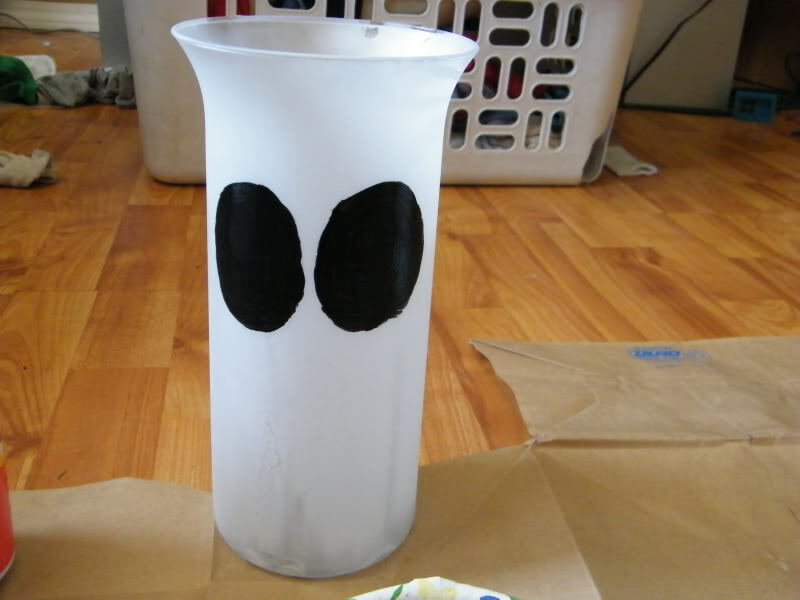 I frosted it with spray paint and then painted some black circles for the eyes. I took some medical gauze (the kind on a roll). And I shredded and ripped it to make it look funky and old. 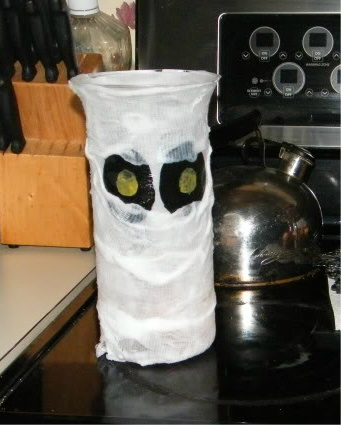 Then, I painted Mod Podge all over the vase and wrapped the gauze all around the vase. 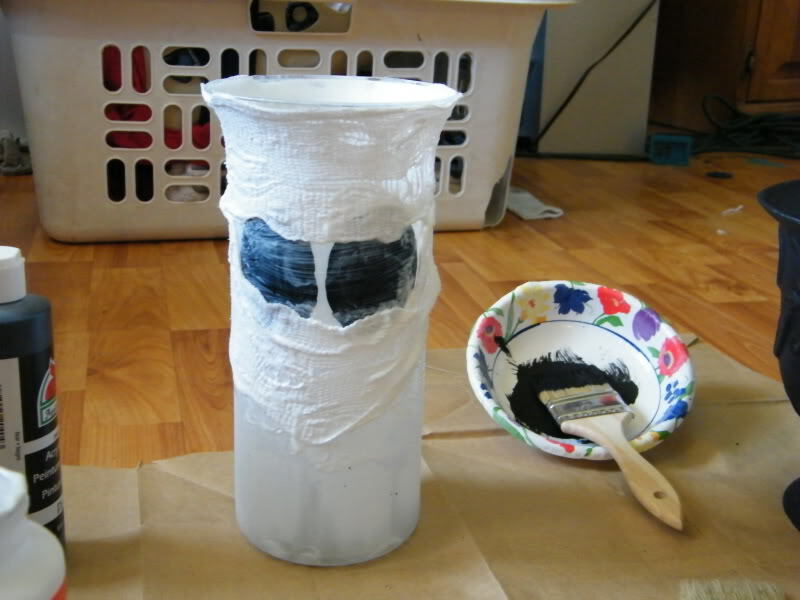 I painted more Mod Podge over the gauze to help it stick to the vase. 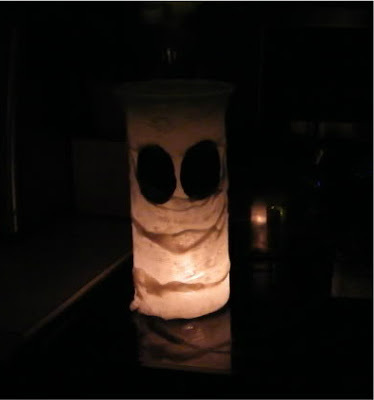 When it dried, I painted some yellow circles on the black to make it look spooky and placed a candle inside. I think this was my favorite Halloween decoration last year, especially since I made it myself. Didn't cost much to make either...Gotta love it. Do you remember that burlap that I scored last week for a $1.30? I decided to make a cute fall bunting with it (and I still have some burlap left over). I cut the burlap into four triangles and stenciled on the letters using black paint. The ribbon was on clearance at Walmart for a dollar a roll - there were three rolls, so I bought all three. I only used one on this project. I already had the paint, twine and stencils. So, for $2.30.....I have a cute fall bunting. 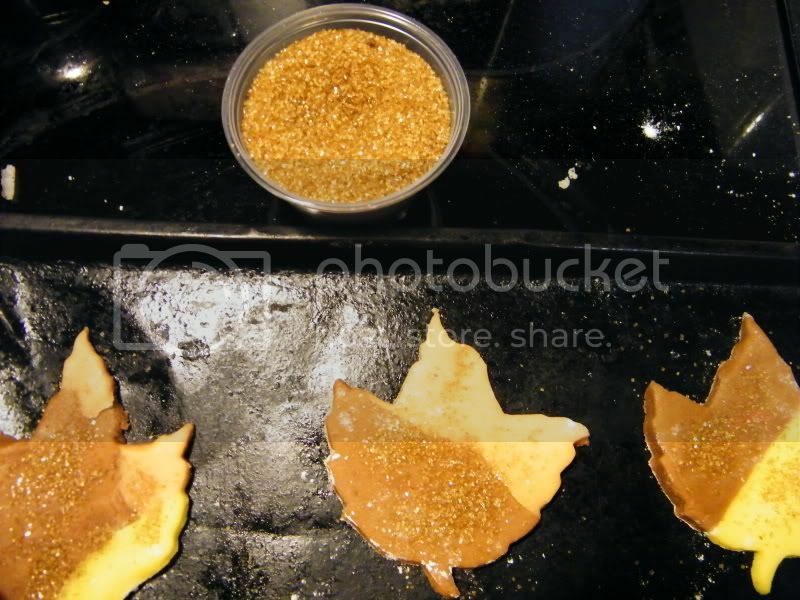 I have been making these for years, they are the perfect treat to celebrate the fall season. Simple to make, but a little time consuming. Mix up your favorite sugar cookie dough. Divide into 3 - 4 sections (depending on how many colors you use). Add food gel colors to the dough (I like the food gel colors, rather than plain food coloring, because the colors come out more vibrant and brighter). 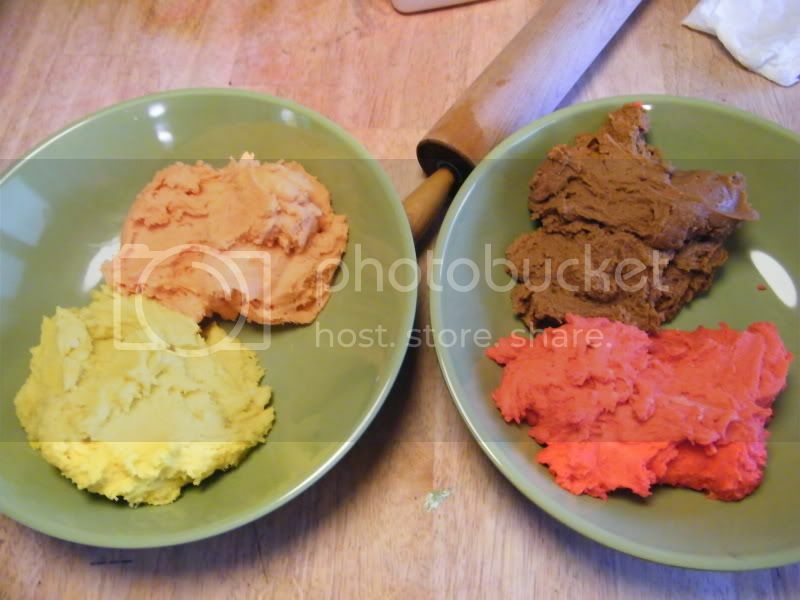 Take a few handfuls of each dough color and roll them out together on a lightly floured surface. 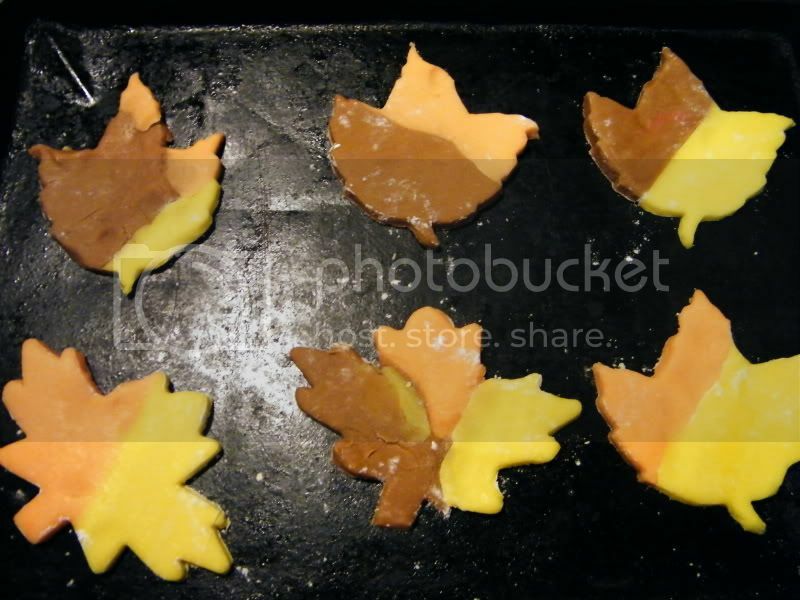 Use leaf shaped or acorn shaped cookie cutters. Then sprinkle with a little sugar. 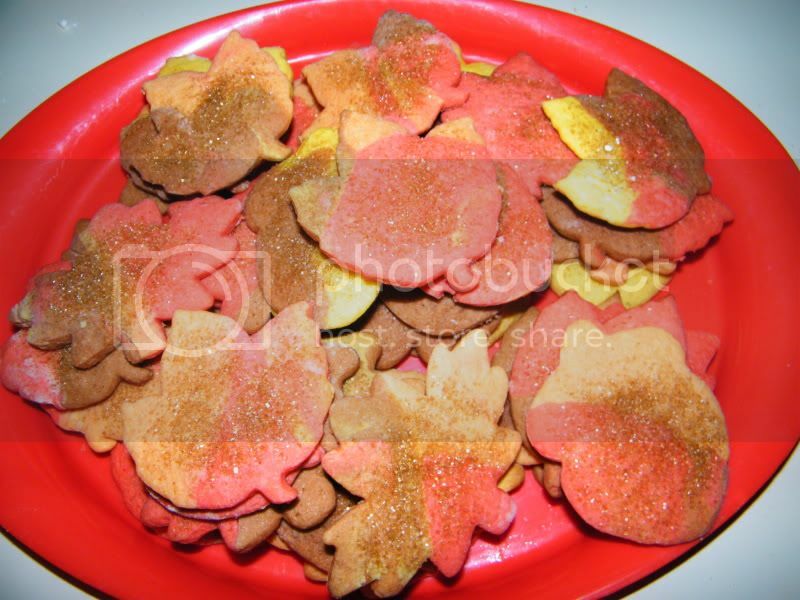 I used brownish gold glittery sugar crystals that I found at the candy/cake store. Don't they almost look too pretty to eat? 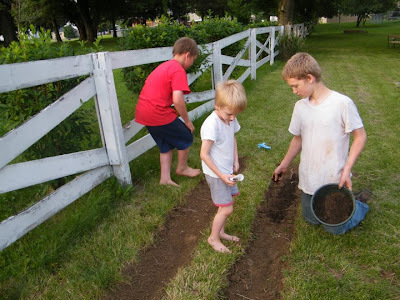 Last fall, the boys and I read a book about sunflowers called Sunflower House by Eve Bunting. They made some cute sunflower crafts to go along with the book. But, what they really wanted to do was plant some sunflower seeds of their own. This spring, we did just that. The hardest part was, of course, the waiting. They started growing, and growing and growing. The boys are so proud of their sunflowers and can't wait to harvest the seeds and plant even more next year. We had a lot of rain recently and it knocked down some of the flowers...no problem, I just cut them and brought them inside to enjoy. We read a few books about sunflowers and how they grow from seeds and how seeds are harvested. We took some paper and some yellow, green and brown paint and went to work. 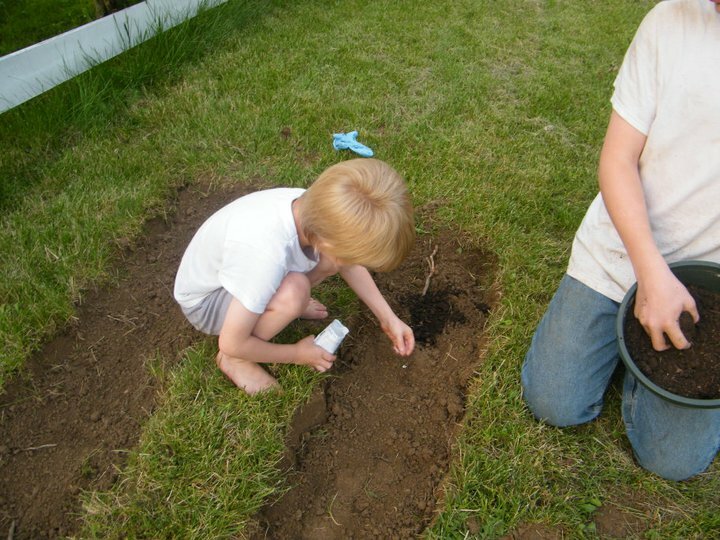 I painted his hand yellow and Nathan made handprints to form a sunflower. Then Nathan painted a stem, some leaves and grass. 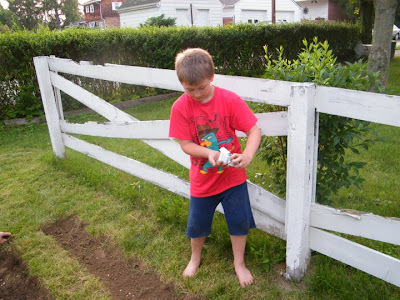 Next, Nathan dipped his fingers into the brown paint and made "seeds"
I was really glad that they could experience firsthand, the process of seeds, watering and tending to a garden. And that they enjoyed it as much as they did. Of course, playing in the sprinkler as they watered the flowers, probably had something to do with how much they loved it. Funny . . . .